Artist Bob Dob has been kicking around the idea of a contest for the opening of his upcoming show “You Should’ve Been Here Yesterday.” He would put tiny numbers next to some of the people depicted in his paintings, and then have gallery-goers fill out sheets of paper, trying to guess who each tagged figure was. The winner would get some kind of prize. The arrangement is used by everyone from art historians to pub trivia quizmasters. 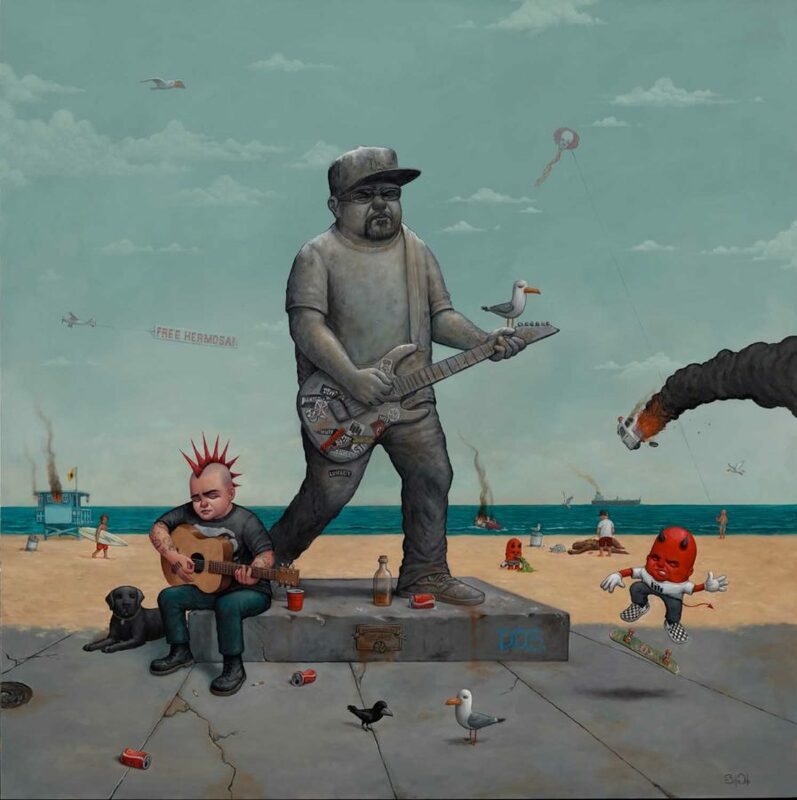 But what makes Dob’s version different is that the people depicted are not historical eminences or tabloid celebrities, but personalities and symbols intimately connected with the South Bay in which he grew up. The thrill of the secret — of seeing something that you know you recognize because of who you are, and knowing that others will miss it for the same reason — is one of the more intimate pleasures art can deliver. But it is inherently at odds with the ability to reach a mass audience, something that Dob, who has spent more than a decade in commercial illustration and teaches at Otis College of Art and Design, knows well. As he prepares for Saturday’s show, he is hopeful that his work will be able to touch those in the know, as well as those who might approach a painting with more uncertainty. “They might not recognize that stuff. They probably wouldn’t unless they lived around here. But they might see the image and go, I didn’t know that, and it will start a conversation. That’s why I create a lot of my artwork, is to get talking. I want people talking. They might say, ‘Ah I don’t like that,’ or ‘It’s disturbing.’ I don’t care, as long as they’re talking,” Dob said. “You Should’ve Been Here Yesterday,” is a surfing shibboleth that, on its surface, conveys that the waves today are not quite what they were the day before. But from the time of its appearance in Bruce Brown’s “Endless Summer,” it has also captured the nostalgia inherent in surfing, a sense that, not so long ago, waves were not just better, but untainted by changes overtaking the world. This backward-looking sensibility is at the heart of Dob’s art of recent years, yet the Hermosa recollections of Dob and those he grew up with are hardly Edenic. “It was grittier. There were Hell’s Angels on the Pier,” Dob said. “It’s definitely a changing place. It was dirtier, rougher,” Moore said. “Those times were raw, they were different. You could get away with a lot more. It was still a little bit like the Wild West,” said Jani Lange, a Hermosa native who was two years behind Dob in school. This is not exactly a new argument. It is a cousin to laments about artists being driven out by gentrification everywhere from New York to Los Angeles. And it finds its local adherents in the annual pre-Thanksgiving Hey Turkey Day, named for Turkey John — another of the transient downtown characters from Dob’s youth — and which will take place at ShockBoxx this year during the run of his show. But at time when an increasing share of the town’s population does not remember cars on the Hermosa Pier, Dob’s belief in the hold the past still claims is a gutsy one. 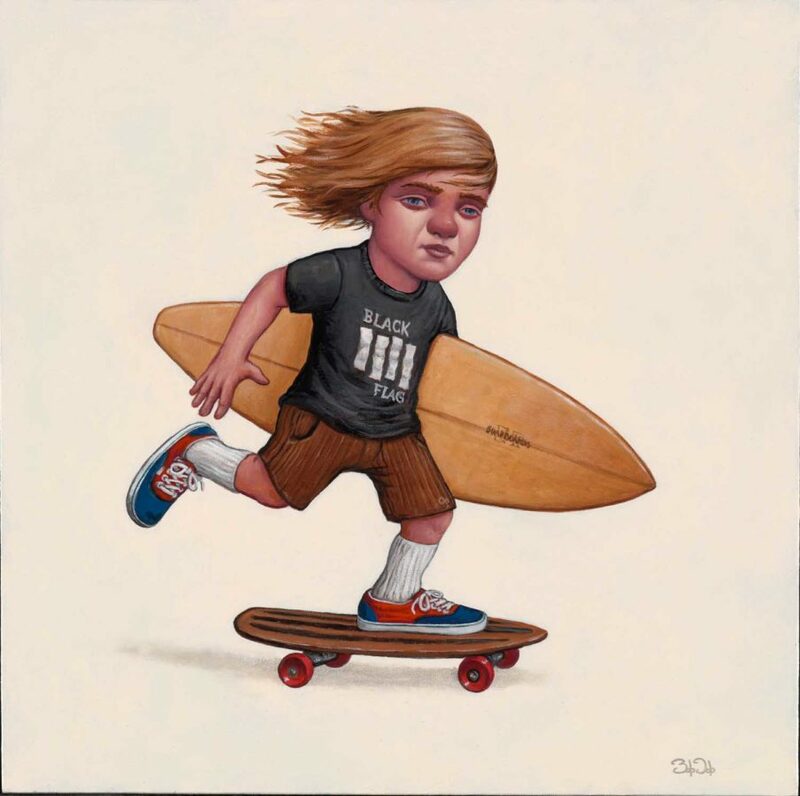 Dob’s work usually depicts kids, a decision partially inspired by his childhood battle with cancer. Dob’s role in capturing the scene he grew up in came about because of a tragic misfortune. When he was nine, he began feeling unusual soreness after playing a soccer game. His parents took him to see a doctor. Within weeks, he had been diagnosed with bone cancer, undergone surgery and was beginning chemotherapy. Backyard parties and local venues like The Strand in Redondo, Frogs in Lawndale, and Velocity in Torrance provided a home base for Lunacy and other “second-wave” South Bay punk acts that followed the success of Pennywise. The scene was high energy and inward-looking. “It almost felt like it made this place ours. That scene was pretty strong around here, and we were part of it. I think they were looked at as bad kids a lot of the time. But for us it was just kids that had strong ties to Hermosa and wanted it to be ours. It was a local feel. You were in Hermosa, you were proud of it. You wanted people to know you were from there,” Moore said. Dob started out as a music theory student, but decided to switch to art and transferred to Otis where he now teaches. There, he was lucky enough to have several good instructors who exposed him to the possibilities of a career in illustrating. He spent a decade in advertising and editorial illustration, and also worked on other projects like book covers. Lunacy came to an end in 2004, around the time one of his former Otis instructors suggested that he submit to a group show at a gallery in Hollywood. His paintings began selling well, and he started submitting to more galleries across the country. Dob describes his style as influenced by cartoons, and there is a levity that flows through his work, even if the people depicted all seem to have a certain dead-eyed sadness. The dynamic comes from his decision to populate his paintings with children, and his own experience with cancer as a child. The difficulty that he encountered shaped him, but he also senses the way that he was able to bounce back and find a whole new direction to explore in life. He’s not certain that adults have the same resilience. “I don’t think kids have an appreciation for life yet. They’re just happy moving on from one thing to the next. But when you get older, you’re like, ‘I just want to live,’” he said. These days, he counts himself among those adults. A wife, kids and jobs with more certain income mean that he makes a push for a solo show a little less frequently, but he’s not complaining, and still smiles at the fact that his kids occasionally get to scrimmage on the same baseball field where he grew up. And he feels rejuvenated by his focus in recent years on the South Bay. “For a while, I felt like a couple of paintings I was doing weren’t me: like I was trying to pander to a specific audience that wasn’t really who I was. I wondered how I could take my style in a different direction. And I thought, You know what? I’m going to dive fully into me growing up,” Dob said. Dob grew up in Hermosa, and credits the grittiness the town possessed at that time with shaping his art. Dob put up some of his work at Hermosa Design, now home to Resin Gallery and the Hermosa Beach Artist Collective, for the Hey Turkey celebration there in 2016. Earlier this year, at the suggestion of Hey Turkey organizer Daniel Inez, he pitched ShockBoxx co-founder Mike Collins on a solo show. Collins loved the idea, and Dob fell in love with the space. “I thought, this is going to be perfect. It has the feel of what I want. When I show in Culver City, or in Hollywood, it’s in a place that’s kind of traditional. This has the feel of, Hey let’s turn this into a gallery. You can tell it used to be a machine shop or something,” Dob said. That Dob was able to have a show at two places on the same block in Hermosa is the result of a transformation in town, one that complicates his assertion that the South Bay decades-distant roughness made for better conditions for cultural production. Dob’s ShockBoxx show arrives at a time when punk rock venues in the South Bay, especially ones open to all ages, have essentially vanished, while three art galleries have sprung up in Hermosa in the past two years. 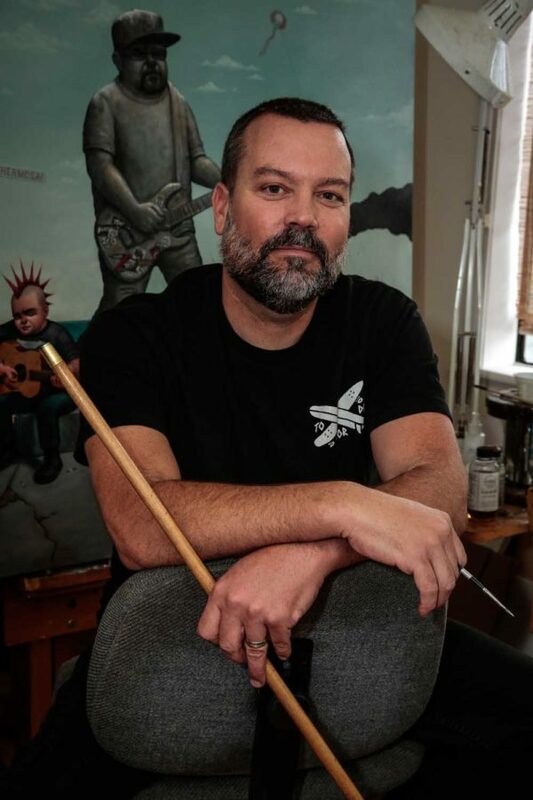 Greg Simkins met Dob through the punk scene. Simkins attended South Torrance High School, and went on to become a successful artist himself. He designed album covers for punk bands like the Deviates, and would eventually share studio space with Dob. Simkins, who once went by the graffiti moniker “Craola,” got into visual art through tagging, which usually meant heading up to the graffiti pavilions in Venice and further afield. For kids in the South Bay, there were few models for visual artists. Simkins and others, though, are quick to add that this does not mean there was no art. Discussing the culture of Hermosa in those times, Moore recalled it as something floating in the ether: empty schoolyards, a Pier with cars, a beach stocked with characters. It might not have been an Ingmar Bergman marathon, but there was the Bijou Theater where now stands a Chase Bank. Orwell’s chronology inverts what has happened in Hermosa, where grit has given way to glitz, but it gets at what Dob and others are trying to convey: the possibility that culture requires an edge to nourish it — that if art is a plant, it is one that grows best on the face of a cliff. “You Should’ve Been Here Yesterday” opens Nov. 17 at ShockBoxx at 636 Cypress Ave. The opening runs from 7 p.m. to 9 p.m.